The Met Office Hadley Centre's sea surface temperature data set, HadSST3 is a monthly global field of SST on a 5° latitude by 5° longitude grid from 1850 to date. The data have been adjusted to minimize the effects of changes in instrumentation throughout the record. 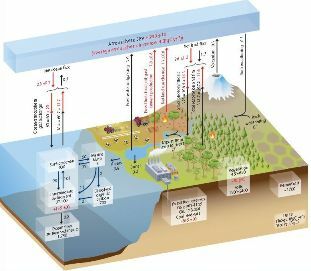 Berkeley Earth is a Berkeley, California based independent non-profit focused on land temperature data analysis for climate science. Berkeley Earth was founded in early 2010 with the goal of addressing the major concerns from outside the scientific community regarding global warming and the instrumental temperature. Berkeley Earth's primary product is an analysis of summary air temperatures over land. Two datasets are provided here; Temperature Lower Troposphere (TLT), and Temperature Lower Stratosphere (TLS). TLT measures the temperatures from the surface up to approximately 10 km, with most weight in approximately 2.5 kilometer height as shown on the left figure below. TLS measures the altitudes from 10 to 30 km as shown in the right figure below. Figure. Height of lower troposphere temperatures (TLT) and lower stratosphere temperatures(TLS). The climate theory predicts that a rise in greenhouse gases will lead to a rise in tropospheric temperatures and a fall in stratospheric temperatures. RSS is a private research company which processes microwave data from a variety of NASA satellites. The monthly data files are used as source for these time series. The University of Huntsville publish monthly records for lower troposphere and lower stratosphere. The troposphere data can be downloaded here. The stratosphere data can be downloaded here. A radiosonde is a small expendable package of instruments which is carried aloft into the atmosphere below a hydrogen, or helium-filled, balloon. As the radiosonde ascends, measurements of temperature and relative humidity are made at 2 second intervals. The balloon typically ascends at 5 m/s to reach a height of about 25 km. 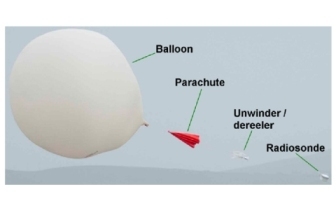 As pressure decreases with height, the balloon expands until it bursts at which point the instrument package returns to earth borne by a parachute. Radiosonde Atmospheric Temperature Products for Assessing Climate (RATPAC) are datasets created through a collaborative effort involving NOAA scientists from the Air Resources Laboratory, the Geophysical Fluid Dynamics Laboratory, and NCEI. Observations in the dataset are collected by hydrogen-filled weather balloons that carry a radiosonde up in the air to measure variables including temperature, humidity, and atmospheric pressure. The RATPAC stations are a subset of the greater Radiosonde Archive of over 1,500 globally distributed stations. RATPAC data come from 85 stations with near-global coverage. The aim of the RATPAC series is to create time series from radiosonde temperatures that are less influenced by historical changes in instruments and measurement practices. Where available, data begin in 1958 and extend through the present. 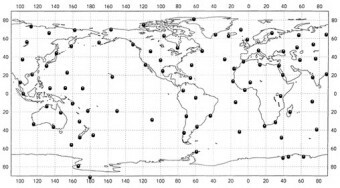 Traditionally, global sea level change has been estimated from tide gauge measurements collected over the last century. 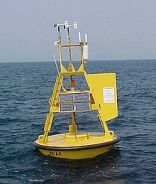 Tide gauges, usually placed on piers, measure the sea level relative to a nearby geodetic benchmark. The most commonly used tide gauge measurement system is a float operating in a stilling well. Surveys of the tide gauge site are performed regularly to account for any settling of the site. Major conclusions from tide gauge data have been that global sea level has risen approximately 10-25 cm during the past century. The first gauge series is based on a selection made by Church and White, referenced below. The grid is 10-degree latitude x 10-degree longitude, i.e. an 18 times 36 grid over the globe. The stations are first averaged in each grid-cell, then the globe average is taken by averaging the grid-cells. This is series at least 75 years long and continuing to at least two years before current. This is series at least 100 years long and continuing to at least two years before current. 60-degree North to North Pole. 60N is the latitude of Hudson Bay, Oslo, Stockholm, Helsinki and the South of Alaska. 60 degrees south to the South Pole. 60S is the latitude of the Northernmost tip of the Antarctic continent. All the globes inhabited continents and islands are located north of 60S. List of gauge stations with data. The presented statistics contains total CO2 emissions, total energy consumption and energy consumption for each major energy source. 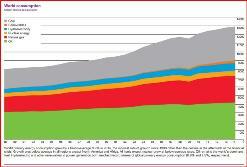 all energy units are converted to Million tons oil equivalents (Mtoe). A few indicators which are relevant for energy production, climate gas emissions, and global air pollution, are presented here. Life-expectancy-at-birth Average number of years that a newborn is expected to live if current mortality rates continue to apply. At least basic sanitation % The percentage of people using improved sanitation facilities that are not shared with other households. This indicator encompasses both people using basic sanitation services as well as those using safely managed sanitation services. Improved sanitation facilities include flush/pour flush to piped sewer systems, septic tanks or pit latrines; ventilated improved pit latrines, compositing toilets or pit latrines with slabs. At least basic drinking w. serv. % The percentage of people using basic water services as well as those using safely managed water services. Basic drinking water services is defined as drinking water from an improved source, provided collection time is not more than 30 minutes for a round trip. Improved water sources include piped water, boreholes or tubewells, protected dug wells, protected springs, and packaged or delivered water. Safe drinking water serv. 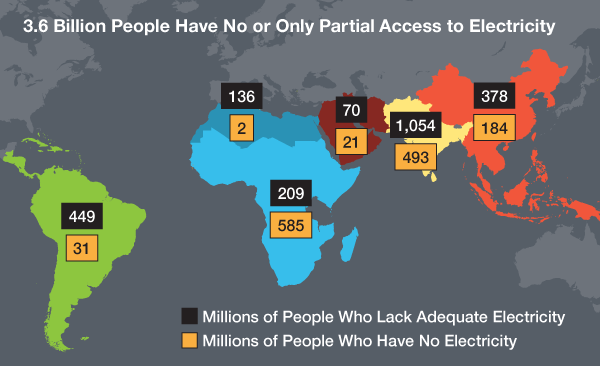 % The percentage of people using drinking water from an improved source that is accessible in homes, available when needed and free from faecal and priority chemical contamination. Improved water sources include piped water, boreholes or tubewells, protected dug wells, protected springs, and packaged or delivered water. CO2 per capita CO2 emissions per capita in metric tons (1000 kg). The trends over the last decades are that the arctic ice has been declining, and the Antarctic ice has a small increase. The overall trend is a declining ice coverage. 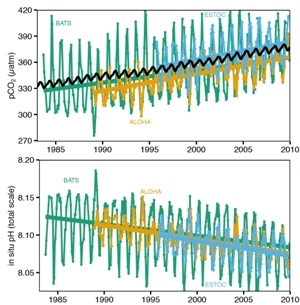 The Ocean PH data and dissolved CO2 data series are from the Hawaii Ocean Time-series (HOT) program and the Bermuda Atlantic Time-series study. The Bermuda series goes back to 1983, and the HOT series start in 1988. Scientists working on the Hawaii Ocean Time-series (HOT) program have been making repeated observations of the hydrography, chemistry and biology of the water column at a station north of Oahu, Hawaii since October 1988. The objective of this research is to provide a comprehensive description of the ocean at a site representative of the North Pacific subtropical gyre. Ph is a measure of acidity and alkalinity in a solution. Pure water at 25 degrees Celsius has a Ph of 7 and is defined as neutral. A Ph below 7 is considered 'acidic' and a Ph above 7 is considered 'alkaline' or 'basic'. Strong acids have a low Ph value. Vinegar has a Ph of approximately 2.2, and sulfuric acid (battery acid) has a Ph of 1.0. Ammonia on the other hand has a Ph of 11.0 and is therefore an example of a strong alkaline solution. The mean pH of ocean waters ranges between 7.5 and 8.4 in the open ocean, which means that the ocean is a mildly alkaline solution. Note that pH also depends on temperature. Pure wate is only neutral at 25 °C and it decreases with increasing temperature. For instance at 0 °C the pH of pure water is 7.47, and at 100 °C it's 6.14. CO2 dissolves in water and the dissolved CO2 forms a weak acid (H2CO) which contribute to lowering the ocean Ph. This process is called 'ocean acidification' although the ocean water is far from being pushed over from alkalinity to acidity, but it moves in the direction of acidity. Ocean acidification can also be caused by other chemical additions or subtractions from the oceans that are natural (e.g., increased volcanic activity, methane hydrate releases, long-term changes in net respiration) or human-induced (e.g., release of nitrogen and sulfur compounds into the atmosphere). Anthropogenic ocean acidification refers to the component of pH reduction that is caused by human activity. According to IPCC (referenced below) the average pH of ocean surface waters has already fallen by about 0.1 units, from about 8.2 to 8.1 (total scale), since the beginning of the industrial revolution. 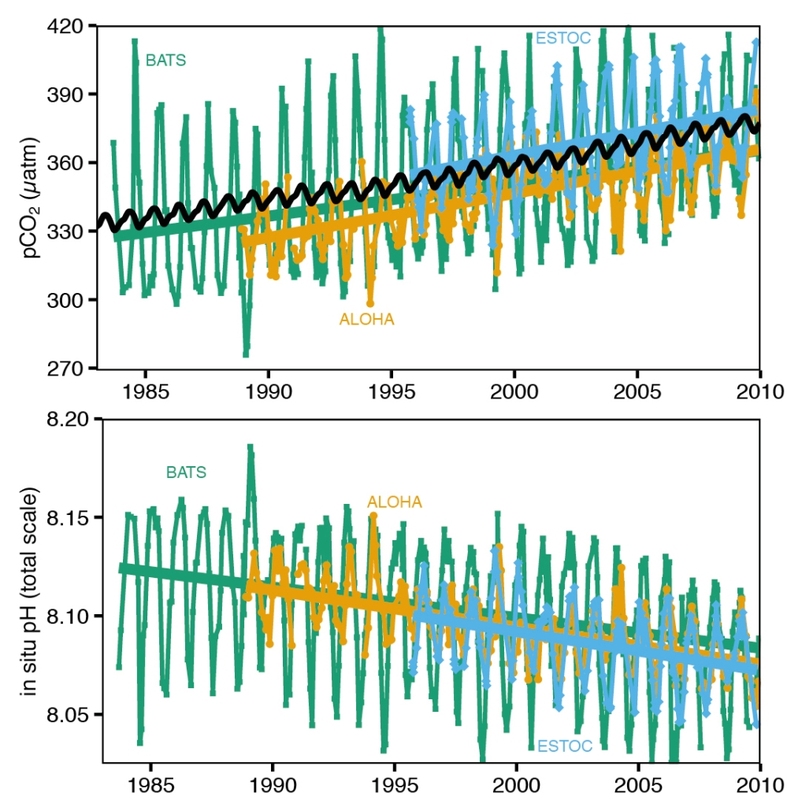 The figure to the right show the connection between increased CO2 level and lowered Ph measured in the ocean surface water. Click for larger image. Since the beginning of the industrial era, the release of CO2 from industrial and agricultural activities has resulted in atmospheric CO2 concentrations that have increased from approximately 280 ppm to about 400 ppm in 2016. 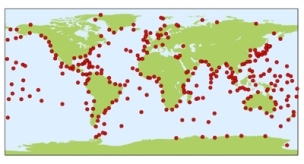 The oceans have absorbed approximately 165 PgC from the atmosphere over the last two and a half centuries. This means that about 40% of the man made CO2 emission has been absorbed by the oceans. The oceans contain approximately 50 times as much carbon as the atmosphere, see figure above. The rate of carbon uptake depends on the atmospheric CO2 level, the surface waters CO2 level, and the surface water temperature. Cold water absorbs more CO2 than warm water. The relation between temperature and CO2 solubility in water is called Henry's Law. This relation has led to the question of whether the increased atmospheric CO2 level could have been caused by increased ocean temperature, and not the other way around. S. Torn, Harte, GEOPHYSICAL RESEARCH LETTERS, VOL. 33, L10703"
The atmospheric CO2 series presented are Global marine surface, the Mauna Loa observatory in Hawaii, and the South Pole observatory. The Mauna Loa has recordings since 1958 and the South Pole data are from 1975. The data are provided by The US National Oceanic and Atmospheric Administration (NOAA). The Mauna loa primary observing site is located at the 3397 m (11,141 ft) level on Mauna Loa's north slopes. 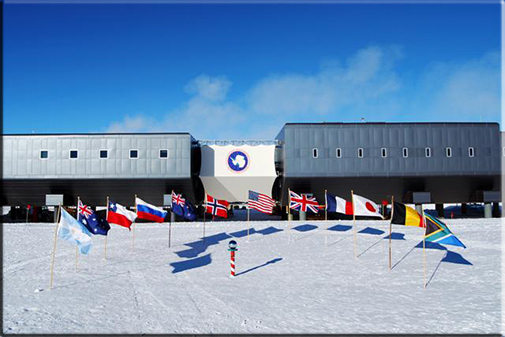 The South Pole observatory is located at the geographical South Pole, 2837 m above sea level. Carbon dioxide is an integral part of the carbon cycle, in which carbon is exchanged between the Earth's oceans, soil, rocks and biosphere. Numbers represent reservoir mass, also called 'carbon stocks' in PgC (1 PgC = 1 billion tons C) and annual carbon exchange fluxes (in PgC per year). Black numbers and arrows indicate reservoir mass and exchange fluxes estimated for the time prior to the Industrial Era, about 1750. The sediment storage is a sum of 150 PgC of the organic carbon in the mixed layer and 1600 PgC of the deep-sea CaCO3 sediments available to neutralize fossil fuel CO2. the Average atmospheric increase of CO2 in the atmosphere, also called 'CO2 growth rate'. The uptake of anthropogenic CO2 by the ocean and by terrestrial ecosystems, often called 'carbon sinks' are the red arrows part of Net land flux and Net ocean flux. The atmospheric CH4 series presented are Global marine surface, the Mauna Loa observatory in Hawaii, and the South Pole observatory. 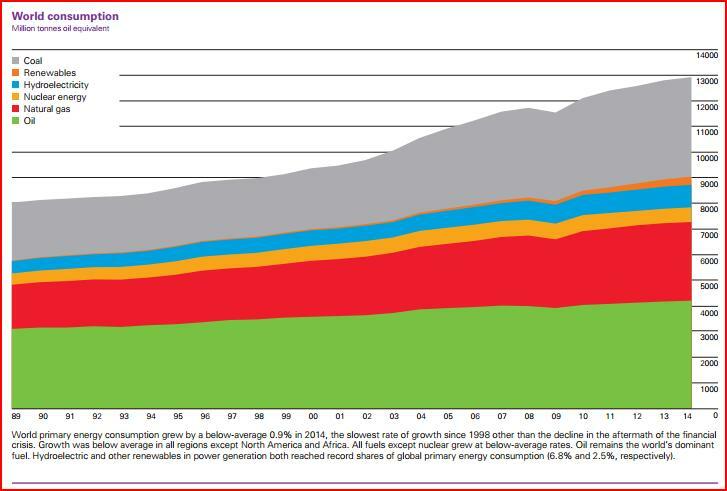 The methane goes back to 1983. The Methane data comes from the same stations in Mauna Loa, Hawaii and South Pole base as the atmospheric CO2 data. Methane (CH4) absorbs infrared radiation relatively stronger per molecule compared to CO2. On the other hand, the methane lifetime is less than 10 years in the troposphere as opposed to the very long lifetime of CO2. Data sources for city pollution are the US Environment Protection Agency (EPA) and Kings College UK. The time series for city pollution are single measurement stations. For cities with several measurements stations the station with the most complete recording has been chosen. The measurements are not suitable for comparisons of the pollution level between different cities, since some measurement stations are located in city centers, and others in the city's surroundings. However, the measurements are well suitable for seeing the development over time. Nitrogen dioxide (NO2), is not to be confused with nitrous oxide (N2O). Nitrogen dioxide is a major local pollutant, but has a short lifetime of approximately 1 day in the atmosphere, depending on temperature and sunlight. Nitrous oxide, on the other hand, has a lifetime in the atmosphere of 114 years and is a greenhouse gas. 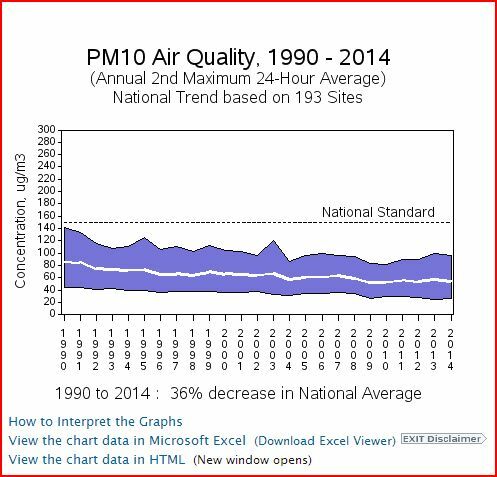 Using a nationwide network of monitoring sites, EPA has developed ambient air quality trends for nitrogen dioxide (NO2), and particle pollution, also called Particulate Matter (PM). 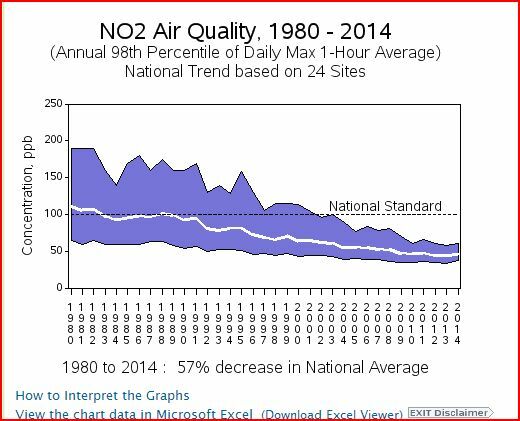 Under the Clean Air Act, EPA sets and reviews national air quality standards. Air quality monitors measure concentrations of NO2 and PM throughout the country. Observed Top of the Atmosphere Shortwave Flux, All-sky conditions. This is outgoing shortwave flux. Observed Top of the Atmosphere Shortwave Flux, Clear-sky conditions This is outgoing shortwave flux assuming clear sky. Observed Top of the Atmosphere Longwave Flux, Clear-sky conditions. This is outgoing longwave flux assuming clear sky. Observed Top of the Atmosphere Net Flux, All-sky conditions This is the net planetary flux. Positve values means net incoming flux, negative values means net outgoing flux. Observed Top of the Atmosphere Albedo, All-sky conditions This is also called the "Planetary_albedo"
Observed Top of the Atmosphere albedo, Clear-sky conditions This is also called "Surface albedo"
Observed Top of the Atmosphere Solar Insolation Flux, All-sky conditions This is the incoming shortwave flux from solar radiation. MODIS derived Aerosol Optical Depths: Aerosol Visible Optical Depth @ 0.55 micron over Land This is the atmosphere optical thickness due to ambient aerosol over land. MODIS derived Aerosol Optical Depths: Aerosol Visible Optical Depth @ 0.55 micron over Ocean This is the atmosphere optical thickness due to ambient aerosol over oceans. EBAF Top of The Atmosphere Net Flux, Monthly Means, All-Sky conditions CERES product TOA fluxes have a positive net imbalance, due mainly to the CERES instrument absolute calibration. The CERES EBAF-TOA product was designed for climate modelers that need a net imbalance constrained to the ocean heat storage term. 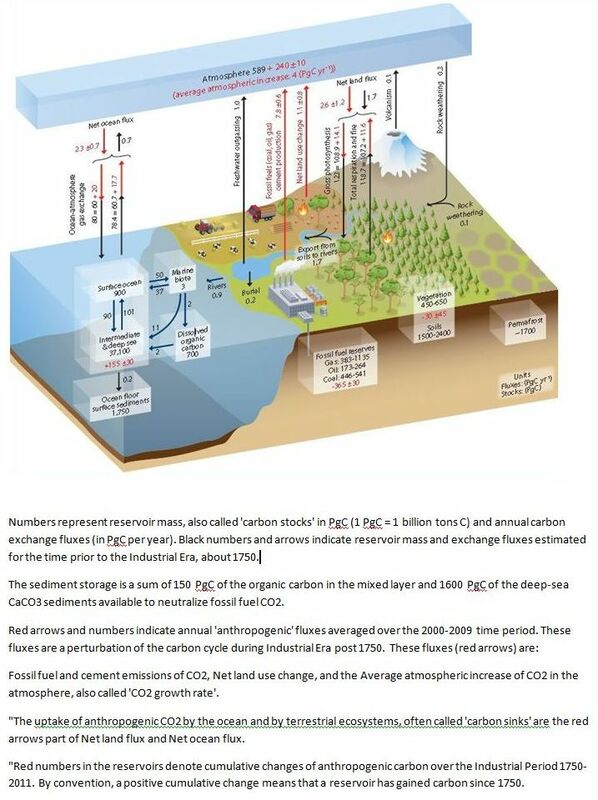 AR5, IPCC's fifth Report Last report by the climate panel. Realclimate.org Climate science presented by the scientists. Climate.etc Judith Curry is a woman who has her own opinion. Sealevel info This site contains lots of data concerning sealevel.